May 8, 2013 – Super Lawyers has selected Michael S. Morgenstern to its 2013 Washington, DC Super Lawyers listing. The highly-regarded rating of the DC area’s outstanding lawyers is published annually. Mr. Morgenstern was recognized for his exceptional work in the area of plaintiff’s personal injury law. 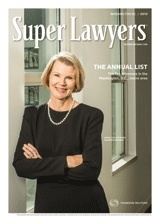 Super Lawyers annually selects outstanding lawyers from more than 70 practice areas who have attained a high degree of peer recognition and professional achievement. Mr. Morgenstern was selected through a rigorous process that included a statewide survey of lawyers, an independent research evaluation of candidates and peer reviews by practice area. Those selected as Super Lawyers comprise no more than five percent of licensed attorneys in the state. Mr. Morgenstern has been named to both Washington, DC and Maryland Super Lawyers listings each year since 2009.